Robeez updates a classic American shoe for your infant or toddler. Inspired by the Native American moccasin, this suede shoe adds modern details such as cream top stitching and has faux fur lining. 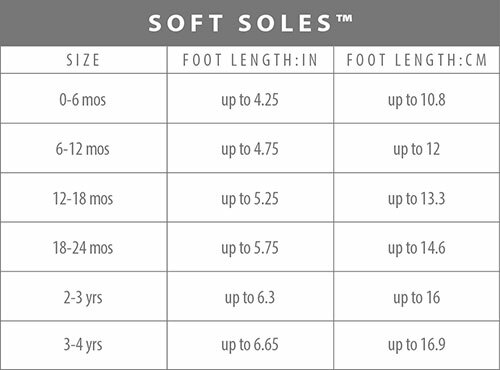 Like all Robeez Soft Soles, this footwear features a non-slip suede outsole, which protects your child from slipping, and an elasticized ankle band which will keep this shoe securely on your baby's foot. If your child can't go barefoot, choose Robeez. Purchased these shoes for my 6 week old son and am so happy with them. The quality and premium materials are evident and when bought on sale the price was on point too. The shoes keep his socks on which is so nice as he discovers his legs! Very pleased with this purchase. I have a little boy who loves these slippers so much, he asks to put them on every morning. Very cute style, nice and warm for Winter. No complaints! Second pair of these for our lil guy and he wears them at his home daycare. Ive bought many robeez over the years, they are my absolute favourite. This particular one however is really terrible as the elastic is really way too tight. Never experienced this with any of the others I've had in the past. I decided after several attempts at stretching them out (overnight with something in place) to urge elastic out & now they don't stay on. I will have to spend more $ at a taylor to have them fixed now. Disappointing given the cost of these slippers. Great mocassins I would like them for me too! Easy to put on and when dirty, I just throw them in the washing machine and air dry and they are as new! The BEST winter time slipper! want to be with out! My grandsons 3rd pair! I just wish they came with washing instructions.